If Labour return to their roots and embrace a socialist platform, I’ll vote for them. If they don’t, I won’t. It’s that simple. We need to give Ed Balls, Yvette Cooper and their coterie a lesson from history. There was once a right wing of the Labour Party that despised “common” people, “forcing” Trade Unions and socialism on the Labour Party, so they flounced off (with Oakeshott as it happens, a triple traitor) to form the SDP. That didn’t get any electoral support, so they merged with the Liberals, whose right wing Orange Bookers were just their type. The Libdems then moved further to the right, with a minor aristo and his political class running the inner circle. Look how that’s turned out for them, now, with the LibDems rightly punished by the electorate, and facing oblivion. Look and learn that the right wing just destroy social capital wherever they are, whatever party colours they steal. The Right of the Labour party needs to understand they are not what we want, and not what we need, and certainly don’t want them using the Labour party as a vehicle simply for their political ambition. If they want to be Tories, have some shred of decency and just defect. Leave, and you will not be missed. Stay, and you will be punished by the electorate too. Ed Milliband needs to strip them out, and start using the resources in the party to regain the 5 million who no longer vote, who used to vote Labour. We need a policy that is a message of hope. We need politicians who actually want what we want. Simples. Absolutely – we need politicians who want what we want, and not politicians who want us to want what THEY want! Unlimited unskilled immigration does indeed affect Labour voters. Being part of a free market mad EU does indeed affect Labour voters. The ideals of actual Labour voters does include rational immigration controls (just like they have in Canada and Australia) and a focus on providing jobs and an income for people in the UK (which is not compatible with kowtowing to the EU freedom of movement nonsense). This state only has the power to look after its own and should restrict itself to doing just that – showing the way for other states to do the same for their own people. Indeed, I have stated many times my own support for rational immigration controls – that does not mean following UKIP into whacko-whacko land. Here you go again Mike knocking the opposition.I warned you about this before.This is one of the reasons of UKIPS success. Labour’s opposition is still the Conservative Party. When UKIP can get more than nine per cent of the electorate on-side, we’ll see where we are then. Unfortunately after the last 17 years Labour are no longer considered the party of the working class. Those at the top of the Labour party have already shown their contempt for the working class by the announcement they wish to break all ties with unions and union funding. It will not be in their best interest to reshape either policies or the structure of the party. Too many Labour MP’s are now drinking at the same trough as the Tories and have acquired a taste for the high life and easy pickings of privatisation. Having spent the last 4 years braying about how much tougher they will be than the Tories on welfare and the unemployed, and how they are the party of “hard working people” (sound familiar ?) one can only wonder at their astounding arrogance in believing a few words now will save them. Racism is NOT the reason for all those voting UKIP nor is ignorance, it is the constant bashing of the poor, unemployed and disabled and Labour’s lack of any meaningful opposition to these measures. Just a chance things can change – if the politicians listen! If Ed Balls has to be sacked for his utterance on immigration-bashing then Mr Miliband should surely go too. When interviewed after his visit to a North West industrial unit over a week ago, Miliband was questioned by the BBC as to what measures, if any, Labour should employ regarding immigration to Britain. He replied – and used this phrase about half a dozen times – that Labour would “bear down” on immigration. If there wasn’t a problem he wouldn’t need to have commented in such a way, he could merely have said, “there is no problem, we don’t intend to do anything about immigration”. But no, he chose to use the phrase “we will bear down on immigration”. Unless one is entirely blinkered the use of this phrase concedes that there is some sort of problem and not just one of the “wrong type” of immigration; he could have explained if he felt that were to be the case but he didn’t. The phrase is aggressive. If UKIP or any other party had used these words, the inference would have been made that “bear down” meant that squadrons of Stukas were to be deployed. One of many other reasons why the vote went the uncomfortable way at the weekend is because of the lies the Europeans tell. Take the camps in Calais that were bulldozed today. France and the EU are guilty of not providing succour to these people – France is many, many time the size of Britain, they are able to help them but they won’t. Which seriously minded Socialist would ever, ever want to be part of such an inhuman construct. We are only paying Brussels £50 million a day – so no (small) change there then. France is not “many, many times the size of Britain” and I think you’re exaggerating the significance of Miliband’s words. There IS a problem with immigration but the solution is to renegotiate the ‘Free Movement’ part of the EU constitution to ensure that it cannot be used for economic opportunism by people from poorer countries, as this overbalances state economies. It’s too late,the damage has been done and we are now feeling the effect of too many people in too small a country.And still they come. There is no proper left wing party anymore. Labour has become right wing and the new left wing parties are mini proto-parties that will take decades to grow if ever. Sadly the votes that should be going left have often been captured by the ultra right-wing UKIP. How many Companies, organisations are Unionised now? “Perhaps you should be asking why we’re NOT voting Labour. 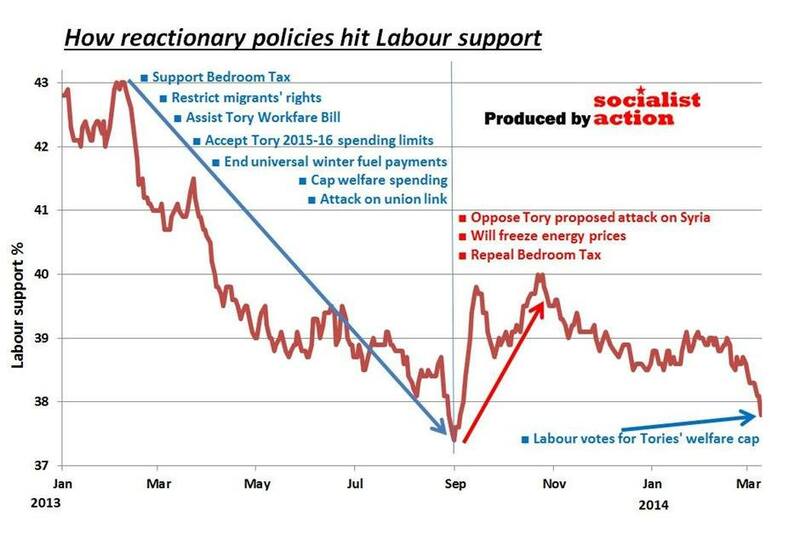 Asking why people vote Labour is really asking for support for your policies. Asking my question may tell you why you may lose the next General Election. Because core voters like me, Labour supporters until the Blairite regime of the 90s are disillusioned with your Tory-like neo-liberal policies that seem to support the wealthy while placating the great masses of the creators of the wealth with the ‘trickle down’ theory that successful business = high wages. You and I know that is not true. You and I know that high wages come from strong Trades Unions and worker co-operative businesses. When will you take a stand for socialism, economic justice and what is patently right? I think you summed up Labour’s big problem in the first Sentence, no one knows what Millibands values really are. the real Labour party is lanquishing on the back benches. They have been rebelling against their party for decades and have stayed true to the original ideals of Labour and socialism calling foul at every turn. Time to bring some of the greatest parliamentarians we have ever known out of obscurity and into positions of influence. John McDonnell for Prime Minister with Jeremy Corbyn, Michael Meacher, Ian Lavery, Ian Mearns, Grahame Morris, Glenda Jackson, Debbie Abrahams, Dennis Skinner I heard a rumour that Ken Livingstone wants to come out of retirement, George Galloway and Dave Nellist should be invited back, I’m sure you can name several more. We could have one of the greatest governments in our life time. We’re going to need the strongest and the best because the mess they will inherit is catastrophic. Oh well it’s nice to dream…..